Not only did he collect their feedback on the preparations for the Kumbh Mela scheduled for January 2019, Shah also discussed strategy for the big battle of 2019. 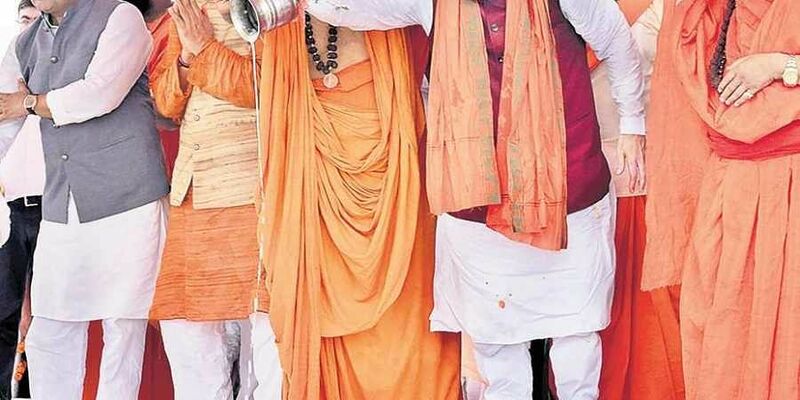 LUCKNOW: Ahead of PM Narendra Modi’s Lucknow visit for groundbreaking ceremony of new projects worth 60,000 crore, BJP chief Amit Shah reached Allahabad to connect with Hindu seers on Friday and sought their blessings for the general elections and the Kumbh Mela. Shah’s four-hour itinerary was packed with temple visits, religious functions, meetings with seers. He held a closed-door meeting at Baghambari Mutt with Mahants of Akhil Bharatiya Akhara Parishad (ABAP). Not only did he collect their feedback on the preparations for the Kumbh Mela scheduled for January 2019, Shah also discussed strategy for the big battle of 2019. Notably, the Akahada Parishad and the saints had put their seal on the name of Narendra Modi as BJP’s prime ministerial candidate at a Dharam Sansad during the 2013 Maha Kumbh. Political pundits, however, believe that Kumbh coinciding with general elections offers BJP an opportunity to connect with a huge and diverse chunk of humanity. The RSS has already communicated to the Yogi Adityanath government to host the Kumbh on a scale like never before. That’s why the BJP government in UP has already decided to send out Kumbh invites to all the 70 lakh odd villages of the country, government officials confirmed. Shah worshipped performing ‘Arti’ at the Yamuna followed by the inauguration of the newly-constructed Siddh Baba Maujgiri Ghat at Siddh Baba Maujgiri Mutt. The BJP national president then proceeded to Bade Hanuman temple at the Kumbh Mela area where he worshipped and headed to Sangam for ‘Arti’. The central government has already pumped in 1,500 crore for the projects and has planned to bring delegates from 192 countries in the Mela.